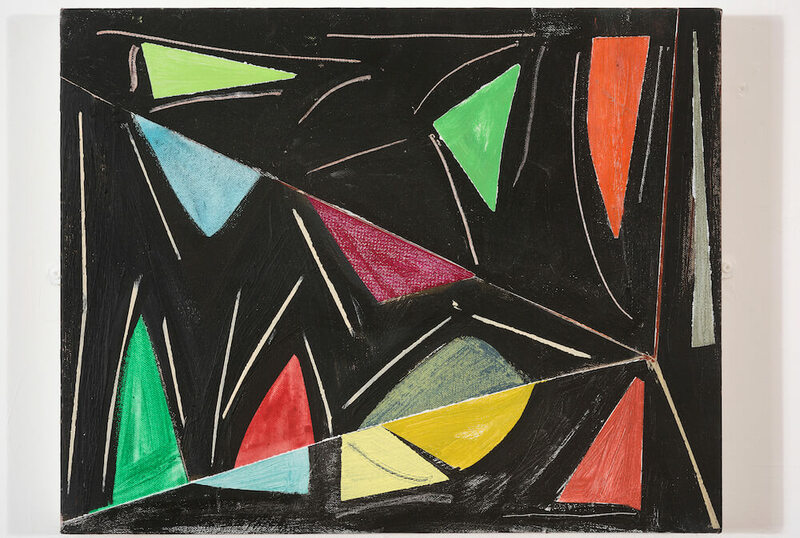 Abstract painter John McLean was diagnosed with Parkinson’s disease in 2013, aged 74. He studied at St Andrews University, Scotland and the Courtauld Institute of Art, London. His first solo show was in 1975 at the Talbot Rice Gallery, Edinburgh, and since then has exhibited at more than more than 30 worldwide. 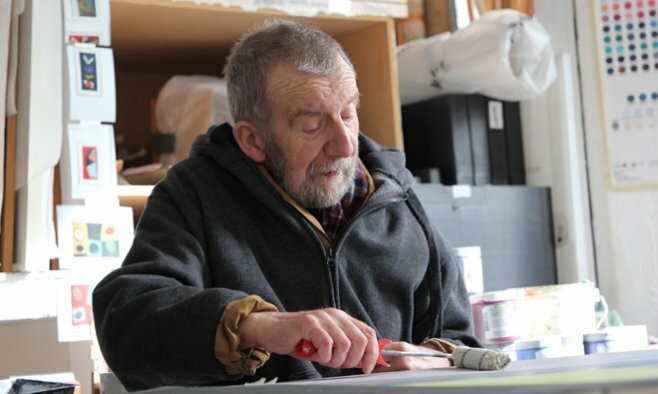 British abstract artist, John McLean, was one of 50 contemporary artists commissioned by the Cure Parkinson’s Trust to create a piece of art for the Cure3 Exhibition. 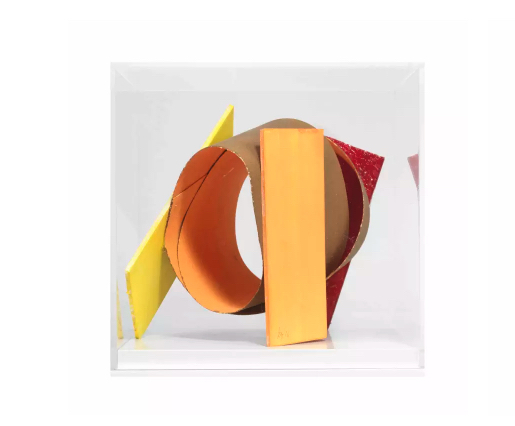 The artists were briefed to work within a 20cm3 perspex box, using the theme ‘Slow – Stop – Reverse’. The boxes were then sold at auction in London to raise money for Parkinson’s research. McLean, however, was the only artist involved in the fundraising exhibition who actually lives with Parkinson’s. In this exclusive interview, the painter tells us about his creative process, how the condition has revealed new ways of working and his hopes for finding a cure. Tell us about how you became involved in the Cure3 exhibition and The Cure Parkinson’s Trust? I actually hadn’t heard of The Cure Parkinson’s Trust, before I got involved in the exhibition, but, of course, I was very interested because I live with Parkinson’s myself. The well-known international art dealer, Mario Palencia, contacted my team about the project and I said that I’d be pleased to do anything that I could do to support the enterprise. How did the idea for your box come about? As soon as my box arrived I looked at it very carefully. I’d been told that I would have complete freedom and do anything that I wanted, so was really looking forward to getting started. I considered it from every angle – looking at the cube and thought about lots of ways of working with it, such as painting the inside and/or the outside of it. In the end I thought that the most interesting thing would be to use the space inside and just use the cube as it must have been intended – as a display case. So I composed inside it, packing the space using cardboard shapes and volumes and painted heavy-duty watercolour paper. So I would be composing with colour. But I didn’t want clutter the space. I wanted to portray some contrast by going up and down in to all the internal vectors of the cube. I’ve used some rectangular elements, which reflect the regularity of the cube itself. Has living with Parkinson’s had an impact on your art? Yes, it has. I now have to get help with the physical aspects of my art. But I have assistants in my studio, like Hideatsu Shiba – who is an artist in his own right – to do some of the work for me. Mixing the paint takes a long time if I try and do it myself, so the assistants do that. Although I do dip the spoons and brushes into the paint pot myself, which means that I’m in complete control of the amount that’s being mixed and the particular shades themselves. But I’ve generally continued along the same ideological path of the abstract as before. Parkinson’s is completely irrelevant to me in how, and why, I appreciate and make art. However, I’ve noticed that I no longer utilise broad-brush affects. I used to paint on huge canvases on the ground with a ‘squeegee mop’ soaked in very wet paint. For the time being I’ve shelved that. I wouldn’t go so far as to say I’d never do it again but for the effect that I’m after, the surfaces has to be a flat, horizontal canvas. I’m not interested in the paint’s response to gravity on a vertical canvas. I’ve noticed more hand-brush strokes coming in, as it seems my fine motor skills are not so badly affected by my Parkinson’s. I never thought I’d find myself saying something as positive as this, but it looks as though having Parkinson’s has exposed me to some techniques that I might have otherwise missed. I’d describe it as an exploitation of colour. My major influences are Henri Matisse, Kenneth Noland and an awful lot of North American and Canadian abstract painters. Also, Wassily Kandinsky wrote a book on spirituality and art called ‘Concerning the Spiritual in Art’, which I support, so I suppose he’s one of my big influences too. Well, my work hangs in museums worldwide and the Yale Center for British Art in New Haven, Connecticut, US, has purchased quite a large collection of my works. My favourite piece currently hangs in the house of its presidents, where it can be seen from the street outside, which is great. The two commissions that I’m really proud of are stained-glass pieces. I have two stained-glass windows on either side of the front entrance at Strawberry Hill House – which is the famous Gothic revival castle built by Horace Walpole in West London, UK in 1747 – to replace the two that shattered in an explosion. And in Norwich Cathedral, UK, I have three stained-glass windows each 14ft high by 10ft across. Can you tell us about any exciting future projects? In 2016 my Chinese art dealer, Wang Xinyou, put on a large show for me at the Chinese Academy of Fine in Beijing, China. We now have plans to put on another one this year at the Guangdong Museum of Art in Guangzhou, China. What advice would you give to other artists who are living with Parkinson’s? Well I’d advise courting good luck. I don’t you know how you’d do that per se, but personally, I try to keep to keep my medication as regular as I can. I don’t know anyone else working as an artist and living with Parkinson’s, but I know other artists who have relatives with Parkinson’s and understand a lot of the difficulties. Do you find the art community to be supportive of Parkinson’s causes? This is the first project that I’ve come across that’s raising money specifically for Parkinson’s causes, but I presume that the wider art community would always want to help the charity sector. My kind of Parkinson’s is actually called Multiple Systems Atrophy (MSA). When I was diagnosed the neurologist explained to me the non-curable and degenerative nature of the condition. And all that seemed pretty final. The speed of degeneration has taken me by surprise, but I find new ways of painting, which opens up vistas rather than closes them. I’m surprised at the number of people that I know that who live with Parkinson’s, but to know that there are people out there trying to find a cure for people like us, well that’s just wonderful! And finding a cure would be an absolute miracle. Inspiring, especially as I find myself lately experimenting to find new ways to keep painting. Superb work. Thank you, John.